Ecuador is a small, un-spoilt paradise, located in South America on the equator. Renowned for its biodiversity and it’s wealth of climates and beautiful landscapes. I believe it’s famous in its own right for its appealing snow-capped Andean peaks. 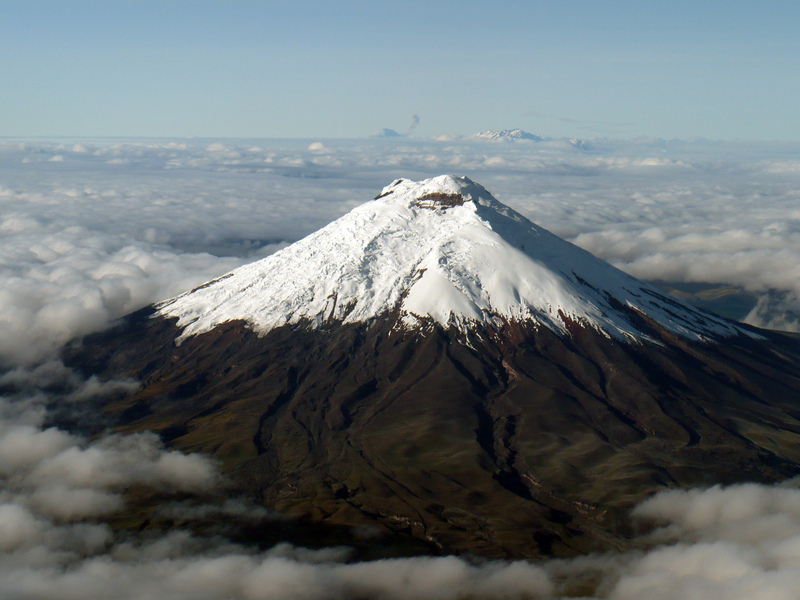 The volcanoes of Ecuador are well-known among climbers, known to most as the ‘Avenue of Volcanoes’, with Cotopaxi (5,897m) being one of the world’s highest active volcanoes! It’s an endless trekking and climbing playground that shouldn’t be under estimated, as their serious peaks and many still active volcanoes. The Andes mountain range stretches 4,400 miles along the western coast of South America, making it the longest mountain range in the world. The mountain range extends over seven countries – Argentina, Bolivia, Chile, Colombia, Ecuador, Peru and Venezuela. Andes Mountains include some of the highest peaks in the world. In fact, more than 50 peaks in the Andes are 6,100 m (20,000 ft) above sea level. The Andes mountain range does not compare to the Himalaya mountain range in height, but it is twice as long. Ecuadorean Andes are home to Mount Chimborazo, which forms the point on the Earth’s surface that is most distant from its centre. 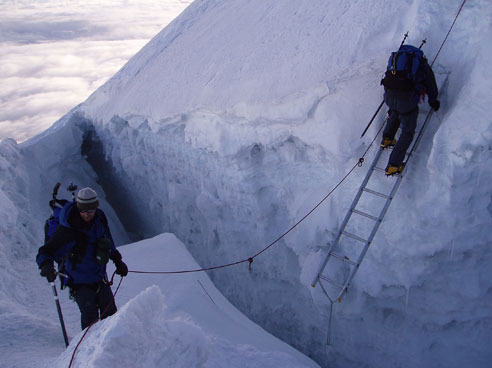 In order to attain these great heights, lots of training and good acclimatization is a key factor. For this reason we built up with some smaller mountains to assist on acclimatization. 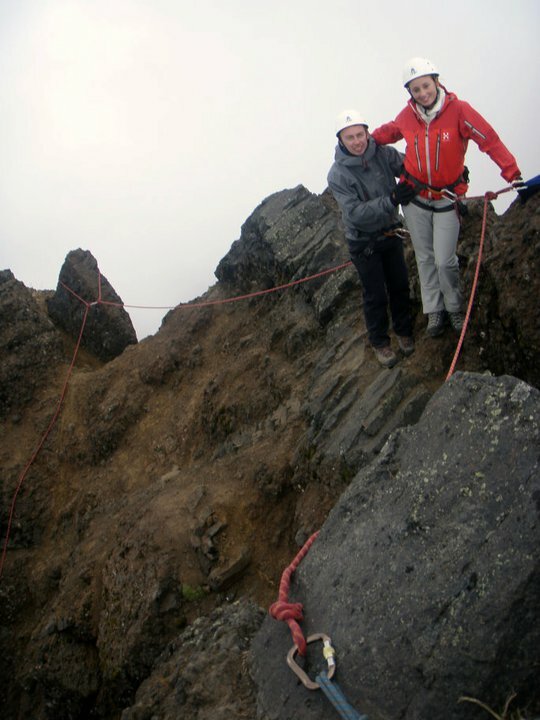 Safety was also a key factor to us and we ensured we were accompanied by a professional ASEGUIM guide, on each climb. 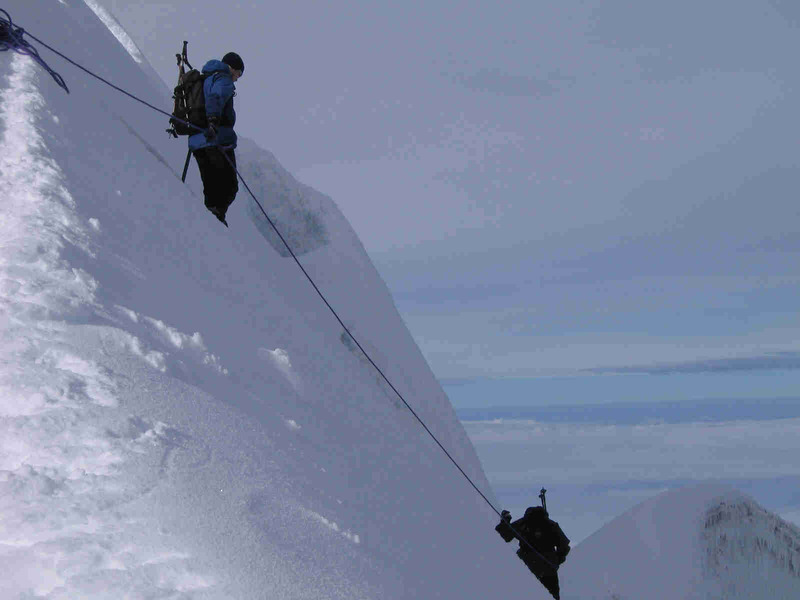 We also decided to take Diamox, a prescribed drug to assist with altitude sickness. We used ‘Columbus Travel’ to arrange our mountaineering trip, booked over the Internet and I can’t recommend them highly enough, tailoring everything to our needs. They have the local contacts and a very good reputation. ‘Marco Gonzales’ met us at our Quito city hotel. Marco was a local Ecuadorian, and was going to be our mountain guide and host along with his family over the next few days whilst we spent time acclimatizing and summiting several peaks in the Avenue of Volcano’s. 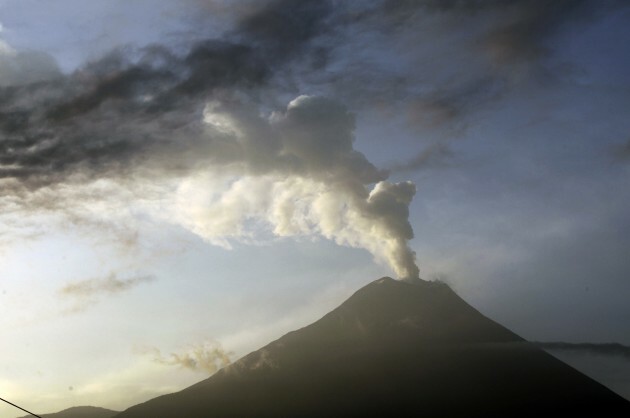 It is called the ‘Avenue of the Volcanoes’ as it’s liberally sprinkled with so many volcanoes in an avenue formation. 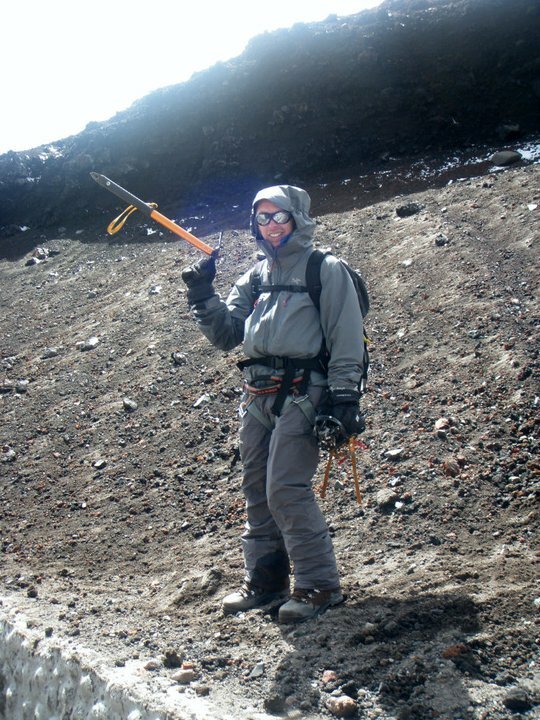 We had a different more experienced guide called ‘Robinson’ for the summit attempt of Cotopaxi. He was a professional, friendly and an excellent guide. 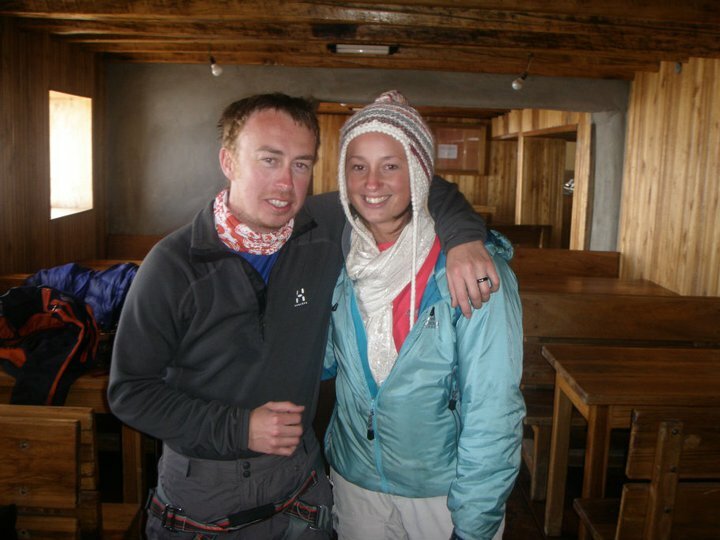 We were going to be guests at Marco’s guesthouse called ‘Chuquiragua lodge’, whilst we were out mountaineering every day, apart from when we attempted Cotopaxi and we stayed at a refuge overnight to break up the summit attempt. ‘Chuquiragua lodge’ was a beautiful, rural lodge situated just off a dirt track inside the Ilinizas reserve, in an area called ‘El Chaupi’. With amazing views of Ilinizas mountain in the distance, set in picturesque grounds with llamas in the garden. You felt totally away from it all here, it was very relaxing. We had a small, en suite room upstairs. Marco and his family were amazing hosts, cooking us an evening meal with all vegetables and salad ingredients sourced fresh from their garden and providing us with a packed lunch daily. As a rule weather in Ecuador seems to be generally unpredictable, especially high in the mountains and it’s not uncommon to experience four seasons in one day! With it being early June when we visited, it was considered the dry season. The weather was dry, warm and pleasant in the afternoons, but first thing in the morning and as soon as the sun went down, it went very cold very quick. After leaving Quito in the morning we drove past the Pan-American Highway to the foot of the extinct volcano ‘Pasochoa’, located in the Guayllabamba river basin in the Ecuadorean Andes. The ascent took us about 4 hours, It was a fairly easy walk up on a narrow track through a woodland area for about an hour; then a couple of hours until you were below the main summit and then it was a narrow, steep path which went up to the top. We ate lunch and enjoyed the breath-taking views of Cotopaxi and the other nearby volcanoes sat on the summit in the sunshine, whilst spotting huge condors gliding around us. It was pretty special! I could feel my breathing was heavy and my legs felt tired way to early on for a walk like this. It didn’t feel good, but all part of the acclimatisation I thought. Pasochoa is accessible to summit all year-round. 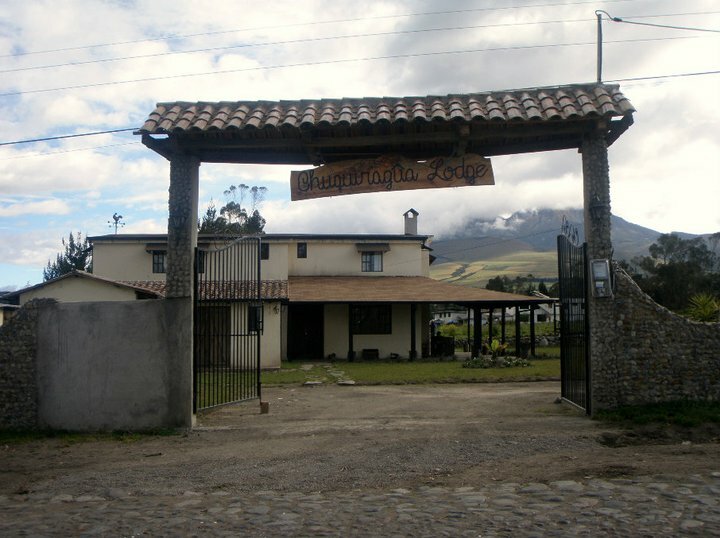 Driving from ‘Chuquiragua lodge’, in direction of the Cotopaxi National Park. 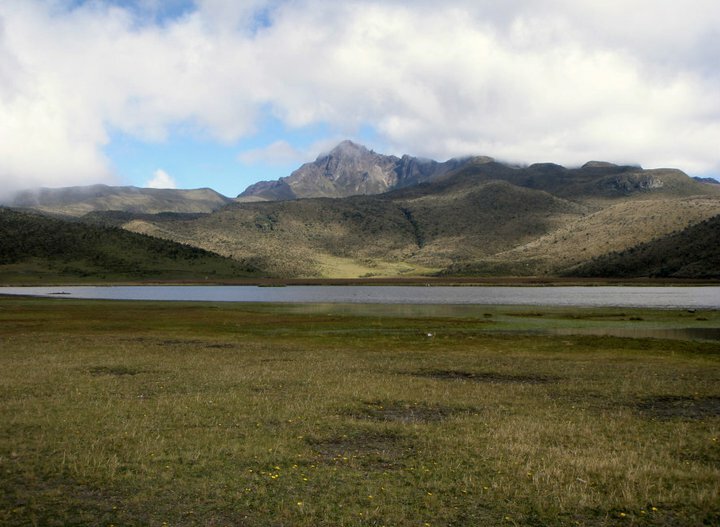 We parked the car and began our walk at the Laguna Limpiopungo, enjoying the amazing scenery of the high plateaus; Ruminahui is classed as one of the most attractive mountains in the Andes. It took us about five hours to reach the top, from what I remember it was a long, steep scree climb to the summit. 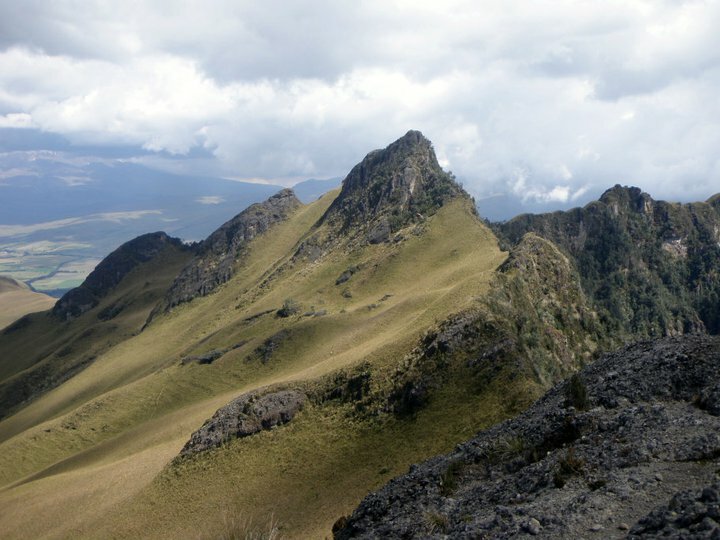 There are three high points are Rumiñahui Norte (4712 m), Rumiñahui Central (4631 m), and Rumiñahui Sur (4696 m). We roped up and summited the highest north summit. The weather was misty, cold and we had light drizzly rain near the top. 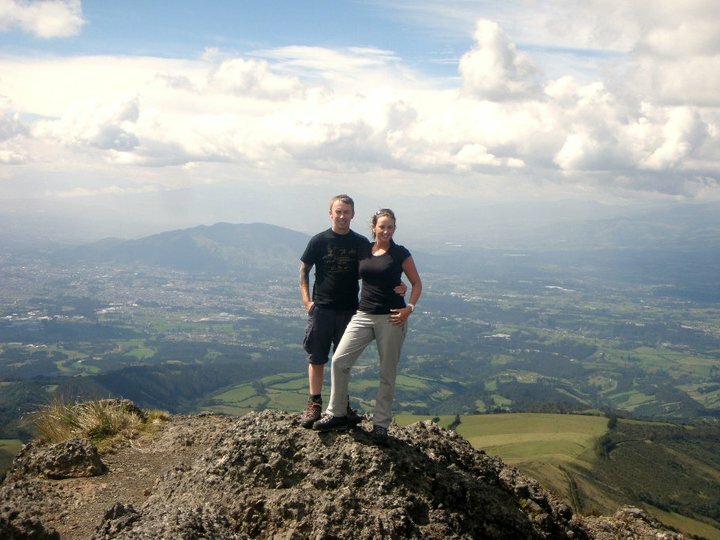 We had a quick kiss to celebrate on the summit, whilst being roped up (was our honeymoon after all) and abseiled back down to where we could put two feet safely back on the ground. It was about a two-hour walk through the countryside back to the lagoon, where the mosquitoes were fierce and as if they were waiting for us. 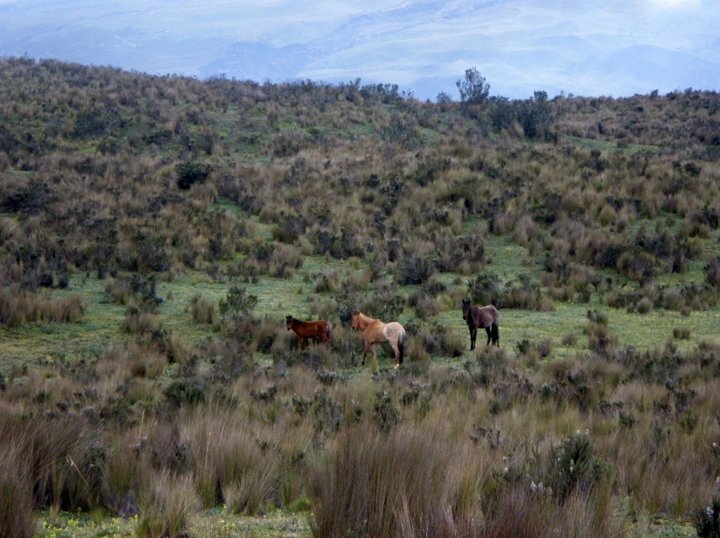 I was so tired coming back down, but was perked up seeing wild horses running free and the spectacular view of Cotopaxi in the distance. 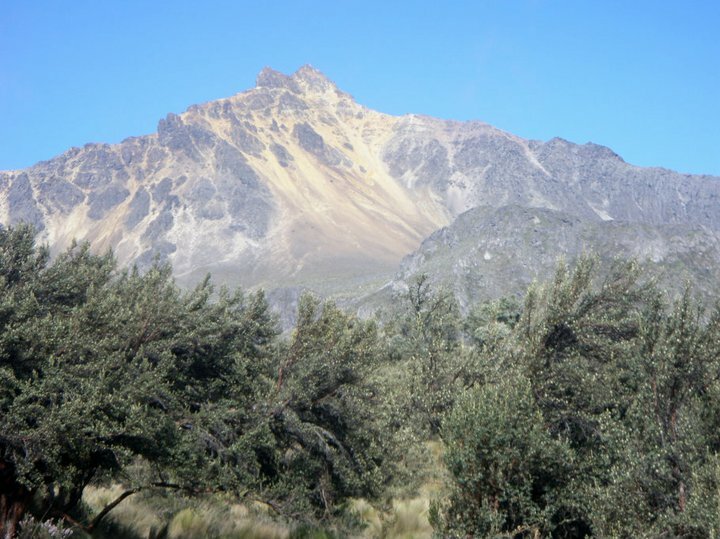 Illinizas is two mountains, IIIiniza Sur (5,263 m) and Illiniza Norte (5,126 m) they used to be one whole volcano featuring a crater, but eventually split in two due to erosion. These peaks are located in the Occidental Andean range. 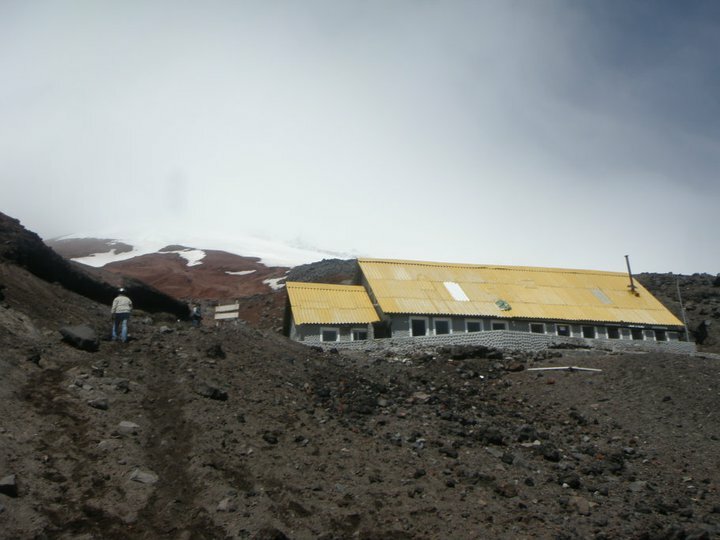 IIIiniza Sur holds more humidity than Illiniza Norte, and therefore Sur has a permanent snow and glacier top. It’s a rocky, technical peak that can be a real challenge for even the most experienced. 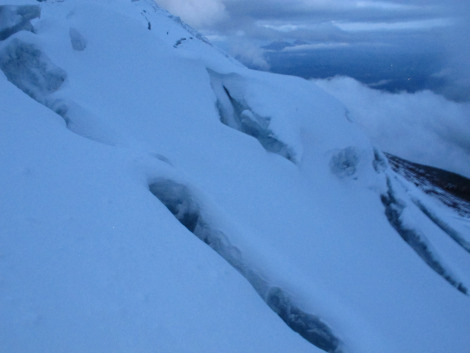 As part of our acclimatisation we were hiking and scrambling towards the Illiniza Norte ridge. We walked for a couple of hours through woodland and were really enjoying the walk until we come head to head with a heard of bulls. Marco our guide was immediately concerned as he warned us to get high on a nearby rock. Apparently bulls that are specially kept here in the high alpine pastures are to make them more aggressive for ‘el torrero’ and can be very dangerous. I hate cows and was so scared, as these animals grunted and surrounded us quite quickly. It was so annoying as we just wanted to get on our way, but couldn’t for ages until they got bored and moved on. Eventually they went! We walked in the sunshine to the ridge had some lunch and walked back – it was a long, frustrating day. 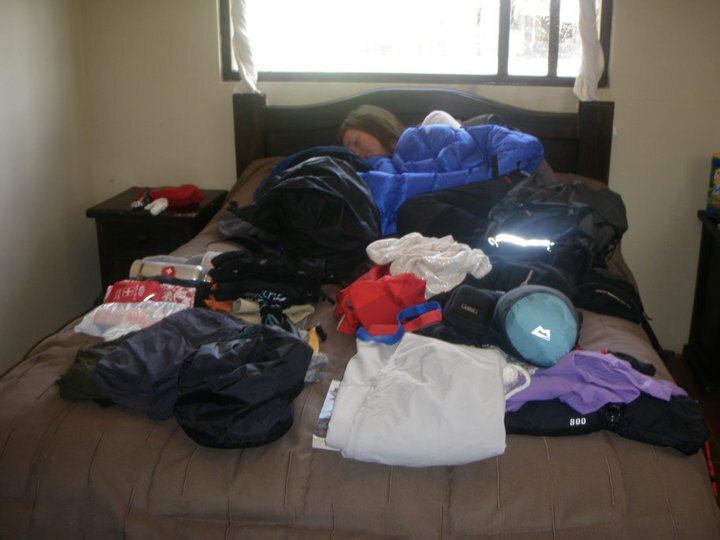 Today we got to have a lie in (meaning till about 8.30am), after breakfast we inspected our equipment and packed it all up; we felt exhausted and could have slept all day. We drove to the parking area where I have never experienced gale force wind like it. Having to stop in a less exposed derelict shelter just before the parking area to prepare our bags, clothing and put our boots on, as this would be so difficult in the exposure of the strong wind. 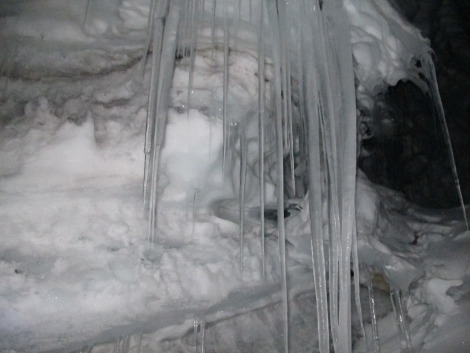 When leaving the car, we had to put stones in front of the wheels in case it rolled away – scary, but it was that bad! After approximately an hour and a half walking, uphill on scree in to the strong wind we arrived at the refuge ‘Jose Ribas’ at 4800m. A simple two-story, concrete building with a yellow, tin sheeted roof. 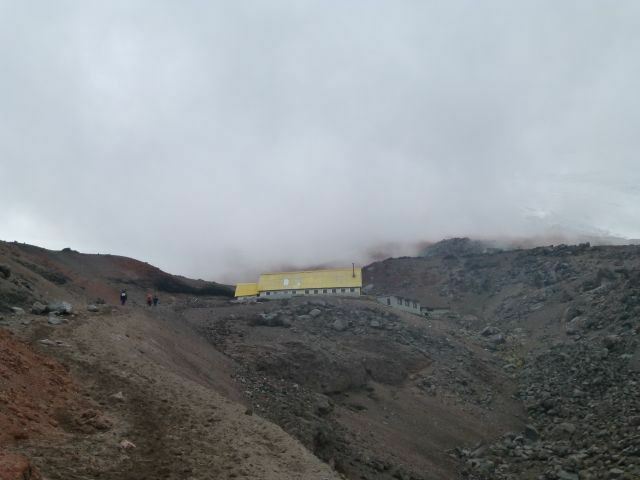 After being shown our bunks, we were meant to spend the afternoon training on the nearest glacier, but due to the extreme wind we decided it was best not to strain ourselves, as the weather was dangerous. 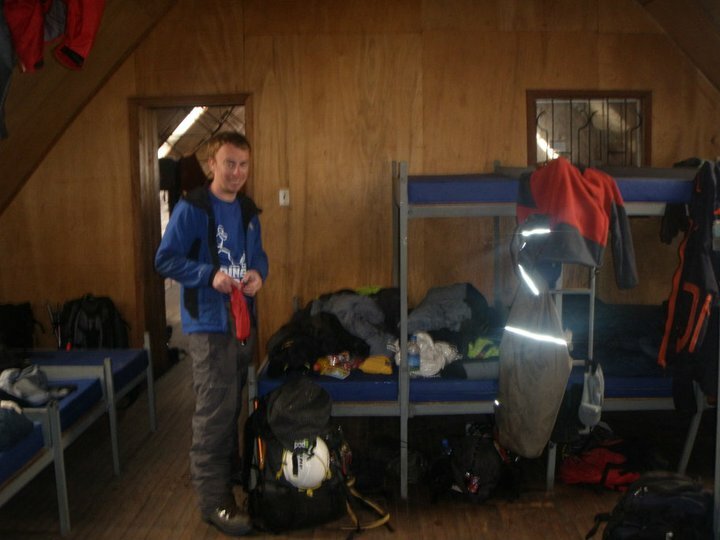 We stayed inside the refuge keeping warm and resting to prepare for the early hours ascent the next morning. The refuge was a basic little hut with wooden tables and chairs down stairs with a cooking area. Then upstairs was a busy dormitory style room. The toilet was in a separate small building outside, with no flushes or even a sink. You had to use a bucket to flush water down the toilet after use and wash your hands in a large freezing cold bucket of water – not a pleasant experience in sub-zero conditions trust me! You have to aim to get to the hut early afternoon, as it fills up quickly even though it sleeps 50 or so people. The night we were there, people were sleeping downstairs on the floor and anywhere there was space. It was about 7.30pm when we turned into our bunks, to try to get some rest for a few hours prior to our planned 12.30am start. We were sleeping on the bottom layer of bunks but adjoined by about ten other bunks so whenever someone rolled over the whole metal frame creaked and rocked – not easy to get any sleep to be honest. But that was the least of our worries the wind was howling outside and apparently a panel from the refuge roof blew off that night. Our guide came to us at 12.30am saying we were going to leave it another half an hour till 1am to see if the wind eases before getting up. We got up 1am to have a warm drink and some breakfast before beginning the ascent at 1.30am, our guide was very concerned about the weather but we were going to attempt anyway he said. 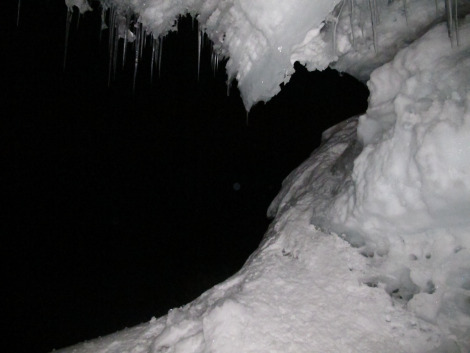 We stepped outside the refuge into the severe cold; the concrete floor was solid ice and the howling wind was extreme. 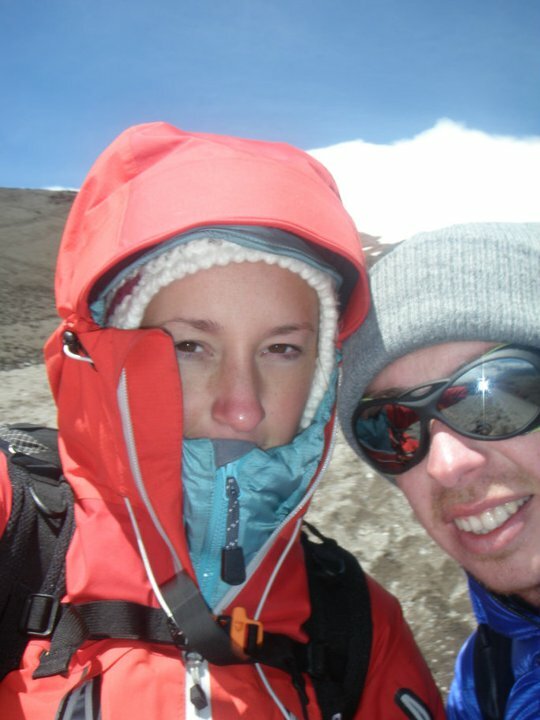 We walked for an hour and a half over frozen scree and snow until we arrived at the bottom of the glacier at 5080m. I was really struggling, fighting against the weather! Being blown to my knees every few steps. I didn’t feel safe at all. The wind was seriously getting the better of me and I knew it was only going to get worse. I made a quick decision to turn around before I jeopardised the attempt for my husband too. I thought if I turn back now he can carry on to summit successfully. He was stronger and fitter than me, had lots of stamina and I knew he wouldn’t want to let it get the better of him. 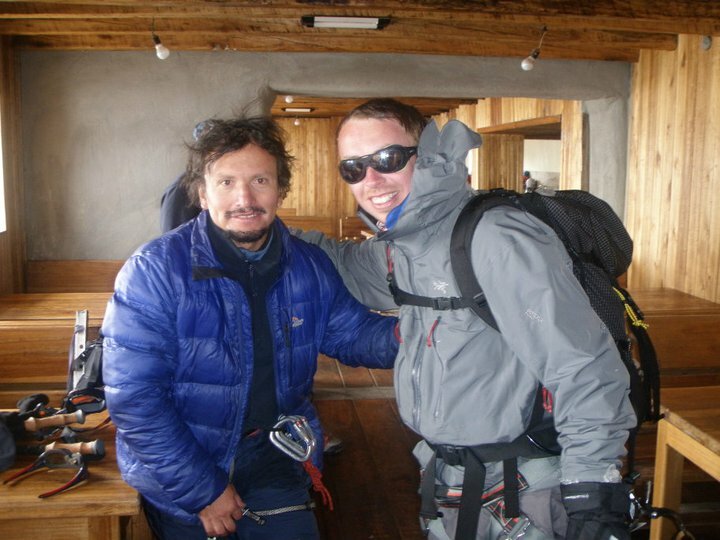 I told the guide and he encouraged me to carry on, but I knew I didn’t feel safe and couldn’t carry on with this extreme gale force wind amongst the huge drops and crevasses ahead. Craig carried on for a further five to six hours, him and our guide reached the summit at 5897m/19560 ft. just after daylight. 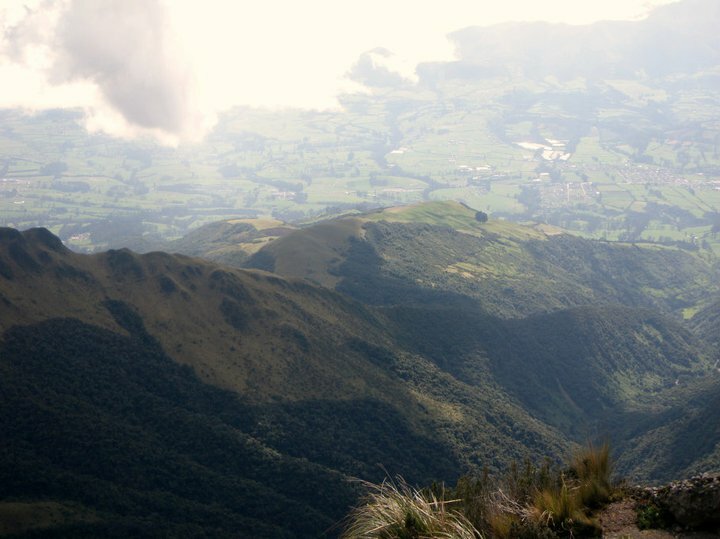 On a clear day you should see the gigantic crater that is 800 meters in diameter, the sea of clouds covering the Amazon, the lane of volcanoes and the other peaks of Cayambe, Antisana, and Chimborazo. But he couldn’t see a thing due to the bad weather. After a long wait and watching out for him, I saw him and his guide descending back to the refuge. He looked exhausted; his legs were giving way like jelly. I had never seen him broken down in this way, I ran out to meet him, feeling so proud. He said, “It was the hardest thing he had ever done”. This is coming from someone who has run marathons and still says to this day ‘Mt Cotopaxi’ is the hardest thing he’s attempted. I helped him into the refuge to have a short rest before descending down to the car. He told me all about the extremities of the experience, including witnessing a fellow climber fall and as he put it ‘flying past him as if she was a crisp packet in wind’. A guide quickly reacted to this though, using an ice axe arrest probably saving her life. 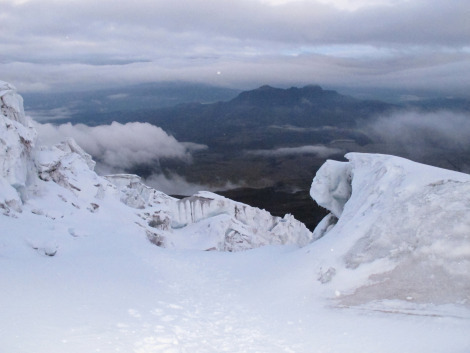 That night 63 people attempted to summit Mt Cotopaxi and only three achieved it. One being my husband – what an amazing triumph and especially over coming the outrageous weather! 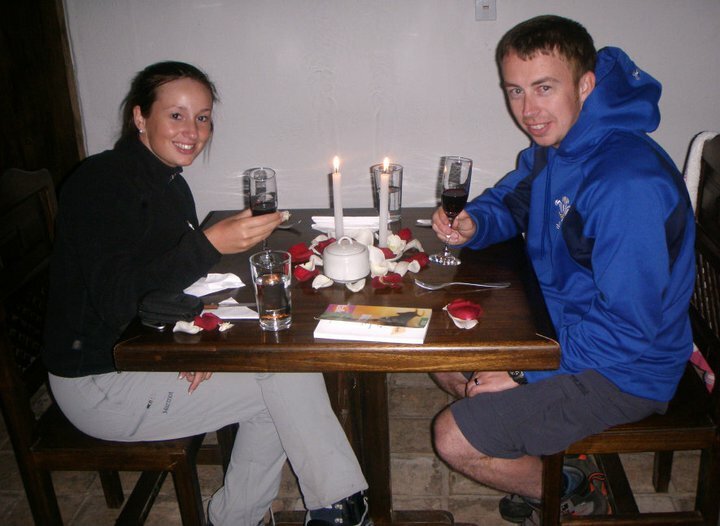 After giving you this insight to the adventure part of our honeymoon, would you consider an adventurous honeymoon??? Great work, glad you enjoyed! Very nice article but the left picture of the refuge looks very familiar to me. Next time please ask me before you just take it. Thanks. Maybe you should use copyright in future, if your that sensitive to people using your photos. Great story. I loved that your husband made it, he’s similar to me I think, stubborn. But you have to try to never ever regret turning back from a mountain. If your gut says you should, you should. Every mountaineer, including those who have summited the world’s toughest mountain, K2, has turned back from a summit. It’s just reality. When I was young I thought I would never turn back from a mountain, but after nearly losing my life several times I changed my thinking. Most do, and the ones who don’t are not around anymore. The mountain cares nothing for your life, only you can safeguard that. Adventurous honeymoon indeed. What an exciting honeymoon! What a future you two have ahead of you – a life of shared adventures. You actually lived to regret turning back. Your husband may have outlived had you decided to press on. Here in New Zealand we hear too many sad stories of bad outcomes for over zealous climbers who refuse to give in to extreme conditions. You have lived to give it a go again on a better day – and I hope you have heaps of these. Have a happy life together and thank you for visiting my blog.